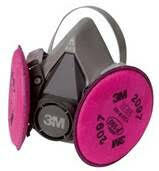 Many agricultural chemicals require respirators in order to be used safely. The Worker Protection Standard mandates that employers provide annual fit tests to their employees, as well as annual respirator training. While there is no formal certification that allows someone to offer fit testing, it's important to be comfortable with the process. This webinar will cover the basics of respirator regulations and selection, and will provide a run-through of qualitative fit testing. Registration link: z.umn.edu/respirators *We will send you an invitation to the webinar via email, so please register! *This webinar will be recorded, but please try to attend the live session to take advantage of Q&A with 3M's respirator experts! To learn more about respirators, see our previous blog posts on fit testing and respirator selection.